As the recipient of the 2016 Nobel Prize for Chemistry, Sir Fraser Stoddart is remarkable not only for his scientific achievements, but also for his unique approach that is inspired by the visual arts, such as paintings, sculpture, architecture and fashion. Stoddart attended the University of Edinburgh, where he earned a bachelor’s degree in 1964, a PhD in 1966 and a Doctor of Science in 1980. He went on to collaborate with Jean-Pierre Sauvage of the University of Strasbourg and Bernard Feringa of the University of Groningen, the chemists with whom he shares his Nobel Prize. Stoddart’s first major breakthrough took place in 1991, when he and colleagues at the University of Birmingham synthesized a “roxatane” — a ring molecule wrapped around a dumbbell-shaped axle, called a molecular shuttle. The ring slides back and forth along the dumbbell, like a bead on an abacus. The roxatane led to more creations, including the trefoil knot, a replica of the five interlocking Olympic rings, and the Borromean rings. The impact of Stoddart’s work is profound. His nanomachines will transform many different fields, from medicine to information technology to energy storage. Molecular motors may be used to transport drugs within cells, to build micro-robots that can be injected into the bloodstream to search for cancer, and to create “smart” materials that can adapt in response to an external signal, much like the human body does. 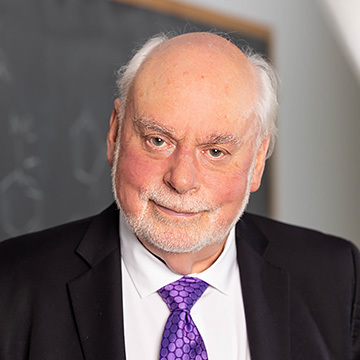 Over the course of his career, Stoddart has also mentored hundreds of U.S. and international chemistry students, who now work in institutions spanning the globe.